Three animals are slashed and stabbed every week, according to shocking figures released by the RSPCA today. Over the past three years, hundreds of calls have flooded into the charity’s hotline about horrific knife attacks on defenceless animals. The charity has launched a major initiative aimed at young people to combat the horrors of abuse and cruelty and lead to a society “which is kinder to both animals and each other”. As the RSPCA revealed how it has received 420 calls over the past three years about knife attacks on animals, it also opened its unsolved case files to show the sickening level of violence targeted by knife thugs. 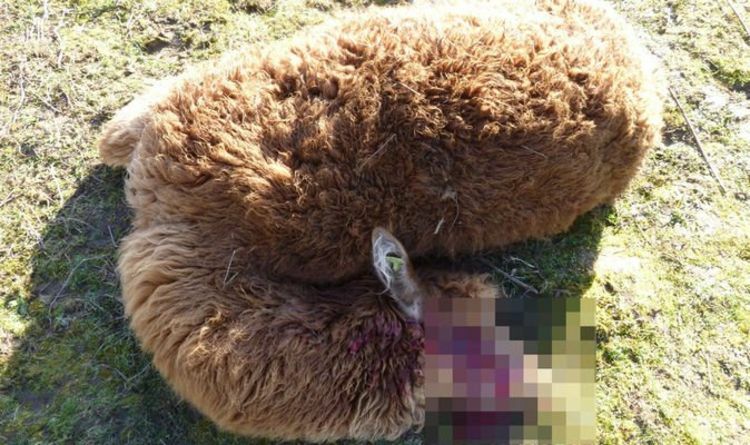 Earlier this year, a ginger-coated alpaca called Ed was killed with his eyes gouged out in a garden in Ludgershall, Buckinghamshire. Devastated owner Amanda Beaumont had only rehomed the gentle animal three months after a knife attacker had slashed another alpaca called Hector to death. RSPCA inspectors launched an investigation into the killing but the case remains open. In another shocking attack, Murphy the Shetland pony was found with horrific wounds on a Sunderland allotment last September having been slashed and stabbed. Vets had no option but to put him asleep. Last January also saw a dog stabbed in the head, stuffed into a suitcase and then fly-tipped in a layby on the outskirts of Halifax. The unfortunate pet had been restrained with his own collar and lead, but, other than the wounds, had been strong and healthy. Britain’s knife crime epidemic has become one of the major political issues of the day, with calls for tougher sentences and stronger powers for the police to take weapons off the streets. There were 285 “sharp instrument” killings in the 12 months ending in March 2018, according to the Office for National Statistics, and this figure marries up to a total of 39,818 knife crime offences over a similar yearly period. Figures released by the RSPCA show how knife attacks on animals rose from 133 incidents to 154 the following year, while slightly dropping to 140 in 2018. Assistant director to the RSPCA inspectorate Dermot Murphy said: “The country has been horrified by the tragic toll that knife crime is having on young people in our towns and cities. Sadly, we are seeing far too many shocking incidents of blades also being used on animals. “These figures are a shocking representation of our times. Sadly, the RSPCA is used to receiving more than a million calls a year about all types of cruelty and neglect but the brutality involved in stabbing a defenceless animal is heart-breaking. Fostering greater respect for animals in an age when one in four of 10 to 18 year olds admit to seeing abuse online is at the heart of the RSPCA’s Generation Kind programme, which comprises of nine projects that range from pairing up disadvantaged young people with traumatised dogs for training courses to running sessions for teachers to help them shape young minds about the importance of kindness to animals. Other aspects of the programme include giving youngsters from deprived areas an opportunity to handle animals and make the environment safer for wildlife; offering RSPCA apprenticeships; providing action days for children in care; training youth offending teams to rehabilitate youngsters who have harmed animals and putting RSPCA inspectors into schools and youth clubs to promote better understanding of animals. By 2030, the RSPCA hopes to have expanded the projects to reach two million children. Mr Murphy continued: “The RSPCA has been refocusing on its prevention work, with the launch of Generation Kind last year. This is the charity’s biggest ever education and prevention programme promoting compassion and empathy for animals which we believe will lead to greater empathy for the people around them. Anyone with information about the above cases should call the RSPCA’s appeals line on 0300 123 8018.